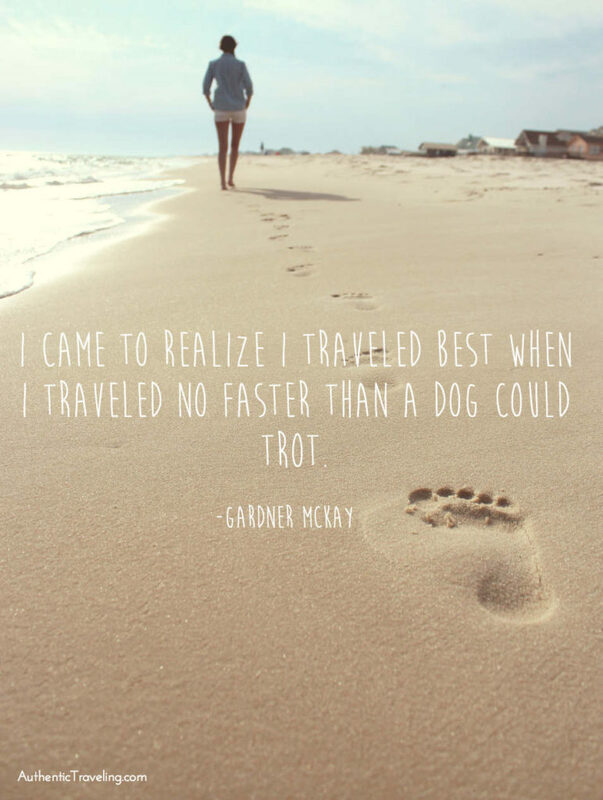 This week's travel quote comes from Gardner McKay, an American writer, actor, and artist. Throughout his life, McKay did things his own way. Having gained considerable fame in Hollywood during the 1950s and '60s, McKay elected to leave acting in the '70s to explore a career as a sculptor, which led to shows at the Metropolitan Museum of Art and the Whitney Museum in New York. McKay was also a relentless adventurer. He rode with the Egyptian camel corps, walked across Venezuela, and even lived alone in the South American jungle for almost two years. Near the end of his life, McKay compiled a memoir of his life, entitled Journey Without a Map. Looking back on his many journeys, he wrote, "I came to realize I traveled best when I traveled no faster than a dog could trot." This quote speaks to McKay's desire to take things slowly—something he demonstrated again and again through his actions. We can all learn from McKay's insight here. The hectic nature of modern life often makes us rush from place to place, a habit that we unfortunately often bring with us when we travel. Slowing down not only helps us to feel at ease, but it also allows us to better appreciate the special aspects of our surroundings. After all, isn't that what travel is all about? I publish a new travel quote ever week, right here. Do you have a particular one you'd like us to feature in the future? What do you think about McKay's insight? Let us know in the comments below! Wonderful quote. Slow down and smell the salt air! What’s your favorite travel-related quote?